Currently viewing the category: "ACTA"
In a move towards greater transparency, the European Patent Office is improving the access to the documents of the Administrative Council of the European Patent Organisation. Under this new policy, all public documents of the Administrative Council will be made available after each session and published on the EPO’s website. The documents of the October 2012 session are already accessible. Today, on August 30, 2013, I can see there a whopping bunch of 17 (seventeen) publicly accessible AC documents dated 2013, most of them reflecting minor technicalities. Even without having any privileged insights into the inner workings of the AC I feel much on the safe side to assert that just 17 published documents are a trickle compared to the full registry of documents circulated in that body during that time period. And, even this publication of a tiny minority of CA documents has not been announced widely and is hardly to find on the website of the EPO if you don’t already know where to look. There appears to be only one valid conclusion: The public repository of CA documents as we see it now merely is sort of a fig leaf excuse for not wanting to have much insight into the CA business for the general public. In this context it is important to closely examine the responsibilities: It would be grossly unfair to blame EPO personnel for this misery, Surely the general policy governing the public availability / confidentiality of CA documents is defined by the CA itself, not by EPO or its President. And the CA is made up of Representatives appointed by the EPC Member States (see Article 26 EPC). And those Representatives are not only selected by their respective national Government but also instructed, briefed, and supervised by the ministry in charge with IP politics (in most cases Ministry of Justice, I’d guess). This means that on a high ministerial level the general thinking is that it would not be good to give plenty of information out to the general public about the proceedings of the CA of the EPO. But it goes from bad to worse. As reported earlier, the public debate on the Anti-Counterfeiting Trade Agreement between the European Union and its Member States, Australia, Canada, Japan, the Republic of Korea, the United Mexican States, the Kingdom of Morocco, New Zealand, the Republic of Singapore, the Swiss Confederation and the United States of America (ACTA) is currently gaining momentum. One of the many problems with ACTA is that it appears not to be clear as to whether or not the Treaty will actually change the law of at least some of its Member states. Each Party shall give effect to the provisions of this Agreement. A Party may implement in its law more extensive enforcement of intellectual property rights than is required by this Agreement, provided that such enforcement does not contravene the provisions of this Agreement. Each Party shall be free to determine the appropriate method of implementing the provisions of this Agreement within its own legal system and practice. In this context it does not come as a surprise that in some of the ACTA signatory states some (if not many) of the provisions provided by ACTA are already in force. 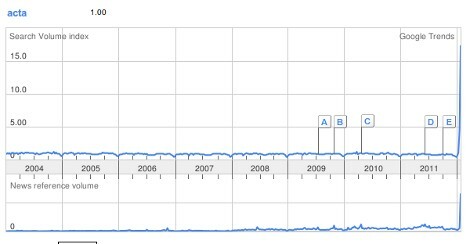 For example, in Germany the first Act on Product Piracy (“Produktpirateriegesetz”) dates back to March 07, 1990. It introduced, inter alia, a right to information addressing the infringer to disclose otherwise confidential information concerning the act of infringement as well as provisions to seize and destroy counterfeit goods. Today, in the EU the laws governing the enforcement of intellectual property right in general and especially the fight against piracy are widely harmonised by secondary EU law. As should be well known to everyone working on patents, copyright, trade marks and the like, the Anti-Counterfeiting Trade Agreement (ACTA) is a plurilateral agreement for the purpose of establishing international standards for intellectual property rights enforcement. In an earlier post on this blog I had reported in October last year on preparations for signing and ratification of ACTA in the EU, predicting that an epic battle on the ratification of ACTA is looming. Meanwhile, the Agreement has been signed on behalf of 31 Member States and on behalf of the EU as well. As ACTA is considered to be a Mixed Agreement interfering with EU competences as well as with national ones it needs ratification not only by the EU Parliament on behalf of the European Union but also of each one of the 27 national Parliaments on behalf of each one of the EU Member States. Hence, starting later this year, we shall be entertained by watching a sort of a round dance of a political ratification theatre on a total of 28 stages including the European Parliament. And in many, if not in all EU Member States, a strong opposition will take the chance to push for a general debate on IP politics. In some of the EU Member States the ACTA dispute may assist the respective national branch of the Pirate Party to enter the Parliament. Current polls on federal level say that the German branch of the Pirate Party may expect around 5% share of the votes for the lower chamber of the German Parliament (“Bundestag”). A broad grassroots movement fueld by protest against ACTA could well help them pass the 5% quorum hurdle. In view of the perceivable decay of the Liberal Democratic Party (“Freie Demokratische Partei”, FDP) which hangs around 3%, the German Piratenpartei might not only see chances to gain seats in the 2013 general elections but also to become junior coalition partner in a future German Government. Do Directives 2001/29 ( 1 ) and 2004/48, ( 2 ) in conjunction with Directives 95/46, ( 3 ) 2000/31 ( 4 ) and 2002/58, ( 5 ) construed in particular in the light of Articles 8 and 10 of the European Convention on the Protection of Human Rights and Fundamental Freedoms, permit Member States to authorise a national court, before which substantive proceedings have been brought and on the basis merely of a statutory provision stating that: ‘They [the national courts] may also issue an injunction against intermediaries whose services are used by a third party to infringe a copyright or related right’, to order a hosting service provider to introduce, for all its customers, in abstracto and as a preventive measure, at its own cost and for an unlimited period, a system for filtering most of the information which is stored on its servers in order to identify on its servers electronic files containing musical, cinematographic or audio-visual work in respect of which SABAM claims to hold rights, and subsequently to block the exchange of such files? This case throws a spotlight on a phenomenon which has become ubiquitous in the age of the Internet: When there is a case of wrongdoing related to the digital domain, stakeholders find that often it is inconvenient, sometimes even practically impossible to go for the primary wrongdoer because of difficulties to identify him or her or because of the wrongdoer is seated in a foreign jurisdiction which might be less than co-operative due to a variety of reasons. Cases based on some sort of infringement of IP rights and related to the digital domain are notorious for this kind of scenario. So why not going for the intermediaries, which are plenty and inevitable necessary for running the Internet, some of them surely located in your own jurisdiction or at least in a foreign jurisdiction which shows a co-operative habit, many rights holders may ask themselves. As reported by Reuters, representatives of Governments of eight nations, namely Japan, the United States, Australia, New Zealand, Canada, Morocco, South Korea and Singapore have signed ACTA on October 01, 2011 in Tokyo. A number of signatories involved in ACTA negotiations, including the European Union, abstained. This does, however, not mean that EU dissociate themselves from the Agreement – there are merely formal obstacles which have to be removed before a signature on behalf of the EU can be given. As reported earlier on this blog, preparatory work of EU Council is underway to sign and ratify ACTA. For further background, see also here. As already reported in my earlier posting, the European Union is just about to sign ACTA, the Anti-Counterfeiting Trade Agreement negotiated between the European Union and its Member States, Australia, Canada, Japan, the Republic of Korea, the United Mexican States, the Kingdom of Morocco, New Zealand, the Republic of Singapore, the Swiss Confederation and the United States of America. ACTA is a proposed plurilateral agreement for the purpose of establishing international standards on intellectual property rights enforcement. Yesterday, the EU Council has published Document 12192/11 conveying a draft Decision saying that the President of the Council (i.e. Mr Herman Van Rompuy) shall be authorised to designate the person(s) empowered to sign the Agreement on behalf of the Union. Moreover, the Official text of ACTA has been published with Document 12196/11. It is to be understood that this text is a Draft only; however, the formal adoption thereof surely will go through on one of the next sessions of the EU Council. However, afterwards that matter will be dealt with in the European Parliament as well as in each of the EU Member States. ACTA is debated controversially because of the secrecy of some of the negotiation rounds. Moreover, there are doubts as to if ACTA is compatible with EU Acquis Communautaire; see my earlier posting there. ACTA was born out of the frustration of the major industrialised economies with progress on monitoring and norm-setting on the enforcement of intellectual property rights in multilateral fora. In the WTO Council for TRIPS (‘TRIPS Council’), Brazil, India and China have consistently blocked the inclusion of enforcement as a permanent agenda item. At the World Intellectual Property Organisation (WIPO), enforcement issues were relegated to a purely advisory committee. consider any other matter that may affect the implementation and operation of ACTA. take other actions in the exercise of its functions. Perhaps, on EU level the function of the ACTA Committee should also be discussed in relation to the planned new compentences of OHIM in the field of IP enforcement. Recently the Directorate-General for External Policies of the Union (Directorate B – Policy Dept.) has published a study conveying an assessment of the Anti-Counterfeiting Trade Agreement (ACTA) which had been requested by the European Parliament’s Committee on International Trade (Contract No. EXPO/B/INTA/FWC/2009-01/Lot7/ 12 June 2011 PE 433.859 / Editorial closing date: 11July 2011). Of course, the study should be construed in a way that any opinions expressed in the document are the sole responsibility of the respective author(s) and do not necessarily represent the official position of the European Parliament. Political debates in coming fall will show the Parliament’s position. As set out in the study, ACTA was born out of the frustration of the major industrialised economies with progress on monitoring and norm-setting on the enforcement of intellectual property rights in multilateral fora. In the WTO Council for TRIPS (‘TRIPS Council’), Brazil, India and China have consistently blocked the inclusion of enforcement as a permanent agenda item. At the World Intellectual Property Organisation (WIPO), enforcement issues were relegated to a purely advisory committee. 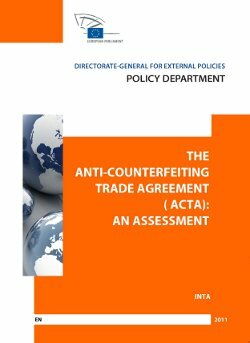 According to the study, ACTA can also be seen as an extension of the existing strategies of the main ACTA parties to include significant provisions on enforcement in their bilateral and regional free trade agreements (FTAs).ACTA was motivated by a desire to establish common provisions in international trade agreements containing rules on anti-counterfeiting. Within the EU the ACTA has been the source of some concerns regarding the non-transparent way it was negotiated and whether it meets to aims agreed by the European Parliament and Commission that it would be compatible with the existing acquis communautaire and the World Trade Organisation’s Trade Related intellectual Property rights (TRIPs) Agreement. is it in conformity with the existing international obligations of the EU and its member states? The question as to whether or not ACTA it in conformity with the EU acquis communautaire is of some political importance. Of course, the respective competent and empowered bodies of the EU are free to extend that acquis communautaire at any time if so decided. However, in view of general concerns of conflicts between ACTA and civil liberties and legitimate economic interests not based on IPRs, plus critics on the murky, secrecy-shrouded history of ACTA, there is a fierce public debate if ACTA should be ratified at all. In order to ease the formal adoption of ACTA, the EU Commission insists on their view that ACTA is merely declarative, i.e. it does not extend the acquis communautaire. If an expert opinion would supply reasons for rejecting this position, the Commission might well come into political trouble. This scenery appears to be the set prepared for the assessment now published. EU Council Document 12193/11 conveying Document COM(2011) 380 final of the EU Commission with a Proposal for a Council Decision on the conclusion, on behalf of the European Union of the Anti-Counterfeiting Trade Agreement (ACTA). Document COM(2011) 379 final, if adopted, authorises the President of the Council to designate the person(s) empowered to sign the ACTA text. Document COM(2011) 380 final, if adopted, approves the Anti-Counterfeiting Trade Agreement (ACTA) on behalf of the European Union. Consent of the European Parliament is required for approving ACTA. Since ACTA is considered “mixed” agreement, all 27 national Parliaments of the EU Member States also need to formally ratify. Some controversial debate is to be expected because of not all parliamentary groups of the European Parliament might be happy with signing and adoption of ACTA. Although the EU Commission claims that ACTA does not modify the EU acquis because EU law is already considerably more advanced than the current international standards, they want it be Officially approved, arguing that it will introduce a new international standard, building upon the World Trade Organisation’s TRIPS Agreement (adopted in 1994). According to the EU Commission, ACTA will provide benefits for EU exporting rightholders operating in the global market who currently suffer systematic and widespread infringements of their copyrights, trademarks, patents, designs and geographical indications abroad. Furthermore, EU Commission re-iterates that ACTA is a balanced agreement because it fully respects the rights of citizens and the concerns of important stakeholders such as consumers, internet providers and partners in developing countries. However, this assertion is likely to be politically contested in the EU Parliament as well as in various quarters of the public. The final wording of ACTA is attached to both Documents mentioned above. A brief summary of the ACTA provisions can be taken from FICPI Working Document EXCO/ZA11/CET/1103 (PDF). Recently the Mexican Senate has voted against ACTA; see here. Some of the patent attorneys of the KSNH law firm have joined their efforts to research what is going on in the various branches of IP law and practice in order to keep themselves, their clients as well as interested circles of the public up to date. This blog is intended to present results of such efforts to a wider public. 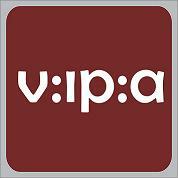 This blog and the German-language sister blog k/s/n/h::jur link to the two popular and privately run blogs IPJur und VisaePatentes and continue their work and mission with a widened scope and under the aegis of our IP law firm. Why not subscribing ksnh::law via e-mail? Simply enter your e-mail address and click OK.
Coercing Applicants With DPMAdirektWeb For TM Applications - A Failed Approach? Thanks for dropping by! Feel free to join the discussion by leaving comments, and stay updated by subscribing to our blog via the RSS feed or via e-mail.